In certain conditions, tree sap may reach extreme negative pressures and emit popping sounds. The crackling sounds wood makes as it burns are familiar to anyone who has roasted marshmallows before a campfire, but as trees get dry, they mysteriously crackle as well. Now scientists find these noises are apparently due to bubbles that loudly pop into existence within trees. These findings could lead to noninvasive means of testing tree health during droughts. "I have seen my death!" proclaimed Anna Roetgen in December of 1895. Anna Roetgen saw through skin, muscle and blood to the dark and askew shape of the bones in her hand. Her husband, Wilhelm Roetgen, had uncovered a mysterious kind of ray. of the left hand of his wife Anna Bertha Ludwig. He called it the X-ray. This week, researchers at the Stanford Linear Accelerator announced that they have created an x-ray beam with two slightly different colors. The research was published in the Physical Review Letters on March 25, 2013. Depending on their electronic structure, atoms and molecules can interact with light differently. Tuning the color of the x-rays will allow researchers to pick out specific atomic and molecular dynamics like how bonds break and rearrange in chemical reactions. X-rays are a form of electromagnetic radiation with a wavelength shorter than UV and visible light but longer than gamma rays. X-ray photons are emitted when an atom is hit with such energy that an electron in an inner orbital excites, or when electrons, accelerated to very high speeds, slam into a metal target. The wavelength of x-rays is so small that x-rays can penetrate deep into materials without scattering or losing energy. Probing the inside of dense matter, x-rays have become a touchstone for science from medical diagnosis to materials research. Now, scientists are bringing x-rays to the next level. For the past century, most of the energy required to get electrons to produce x-rays was lost as heat. Moreover, techniques for making x-rays resulted in the electrons producing many wavelengths within the x-ray spectrum. With the goal of studying atoms and molecules in motion, scientists want to use x-rays that are all the same color, phase, and direction. These are called coherent x-rays. There are only a handful of places in the world where it's possible to find coherent x-rays. One is the Stanford Linear Accelerator Linac Coherent Light Source. At the SLAC Linac, scientists send electrons down a two-mile-long shoot where they are jostled by strong magnetic fields to produce x-rays. In the research published this week, by offsetting two magnetic fields, the team was able to produce pulses of coherent x-rays at slightly different wavelengths. Using bursts of x-rays, like a strobe light, the researchers were able to take what are effectively stop-motion photos of molecules in motion. While new methods of controlling x-ray generation will push the bounds of chemical and materials science, accelerators like SLAC offer scientists limited time to use its x-ray laser beams. To address this, last year a research group at CU Boulder and JILA demonstrated a table-top opportunity to study nature at the ultrafast and ultrasmall scale. We should all look forward to the treasure chest of new science within reach now that x-ray laser sources become more precise and available! 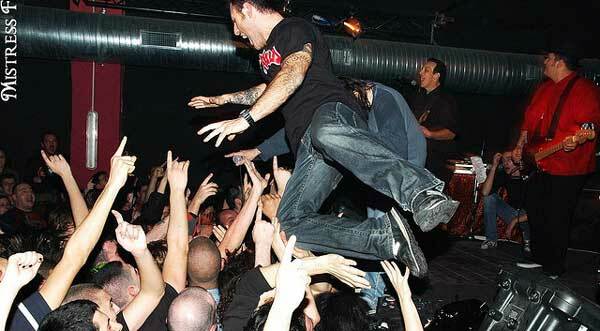 As promised, today's Physics Central Podcast is about the physics of mosh pits! Ever notice when you're walking through a crowded place that people tend to organize themselves into lanes (without anyone telling them to)? You can actually make the comparison between that sort of behavior and the way a bunch of birds manage to form a flock, even when they don't have an exact flight plan. But organizing yourself into a line with other people makes sense; it could just be that we all see what's happening and make the most logical decision. But data showing the collective behavior of very large crowds of people in more extreme cases (like a mass panic) show that collective behaviors still emerge. So in the extreme case of a mosh pit, do those same collective behaviors emerge? Do people suddenly act like birds in a flock or particles in a gas? Some early research by Jesse Silverberg and Matthew Bierbaum of Cornell University shows that yes: collective behaviors emerge in mosh pits. The duo also saw some highly unique collective behaviors: like multiple circle pits colliding, merging and annihilating each other. 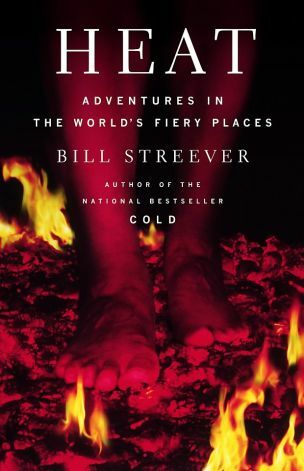 People behaving like antimatter? Maybe. Furthermore, if mosh pits have similarities to situations where large crowds get out of control, they could provide a valuable source of data (you can find a mosh pit somewhere in the world on any night of the week; but larger, undesirable crowd events are harder to find and observe). And be sure to subscribe to the Physics Central Podcast via iTunes! Researchers at Georgia Institute of Technology and Purdue University have devised a solar cell that makes solar energy truly renewable. parts of the cell after it was dissolved in water and the organic solvent. By using plant-based materials to build solar cells, the researchers were able to make a solar cell that has a higher efficiency than any previous organic solar cell and simply dissolves in water at the end of its lifetime. The research was published March 25, 2013 in the journal Scientific Reports. For all their renewable energy benefits, many current photovoltaic solar cells are made with glass, and plastic or petroleum-based materials that are both expensive to produce and difficult to recycle. Solar cells made with organic materials are comparatively cheaper to make, mechanically flexible and are more easily recycled. The team at Georgia Institute of Technology and Purdue University selected to focus on a familiar organic material: cellulose. Cellulose is like the cinder block of the plant world. In tree leaves, cellulose gives the plant cell walls their structure. 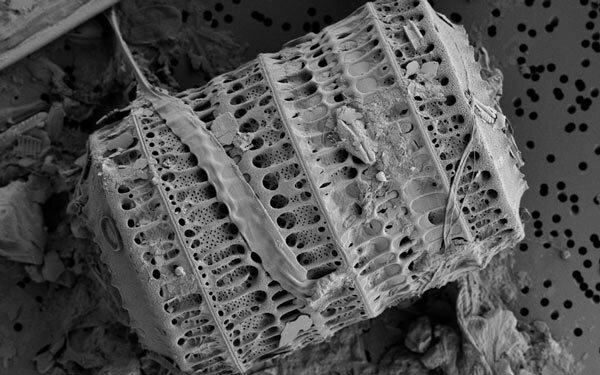 Under a microscope, you can also see how cellulose forms tiny needle-like crystals. In their study, the researchers used a transparent sheet of these cellulose nanocrystals (CNC's) as the base for a small solar cell. Light traveled through the transparent CNC substrate and was absorbed by a very thin organic semiconductor where the energy of the photons creates an electrical current. A common measurement of how well a solar cell works is its power conversion efficiency. The power conversion efficiency of a solar cell measures how much of the incoming energy from the sun is converted into energy we can use as electricity. Current commercial solar cells average about 15% efficiency. The researchers report their new cellulose substrate organic solar cell had 2.7% power conversion efficiency. While 2.7% is a ways away from 15%, the researchers believe that their cellulose-based solar cell could be competitive with commercial technologies if they can push the power conversion efficiency to only 5% and have their devices last 5 years. This brings us to one of the most intriguing aspects of a cellulose-based organic solar cell. We have a huge amount of technological detritus. From old batteries to computers, TVs, radios, and cellphones, old electronics produce an enormous amount of toxic trash. A cornerstone of the new research is the biodegradability of cellulose-based photovoltaics. 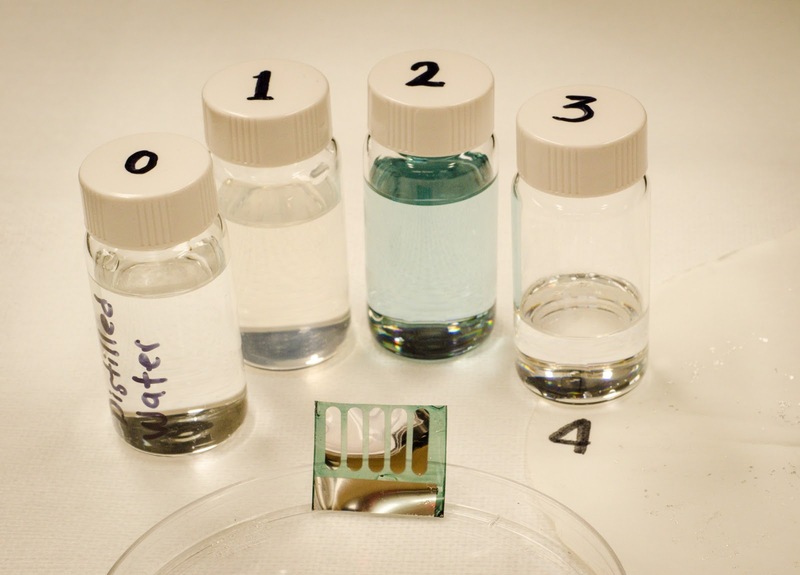 The scientists report that their solar cell essentially dissolves in room temperature water. While they don't say how this might work in the case of rain, the researchers write that their cellulose substrate dissolves and each component of the photovoltaic can be easily separated at the end of the solar cell's lifetime. "Organic solar cells must be recyclable," said lead author Bernard Kippelen in a statement at Georgia Tech, "Otherwise, we are simply solving one problem, less dependence on fossil fuels, while creating another, a technology that produces energy from renewable sources but is not disposable at the end of its life cycle." Last week, over 9,000 physicists, students, and journalists converged in Baltimore, Maryland for the American Physical Society's largest annual meeting. With over 750 sessions and several talks per session, there was no shortage of big ideas this year. While many of the talks were technical and specialized, several research talks spawned media reports from outlets including Science Now, Science News, and NPR. Here's just a small sample of the fascinating research that emerged from last week's meeting. 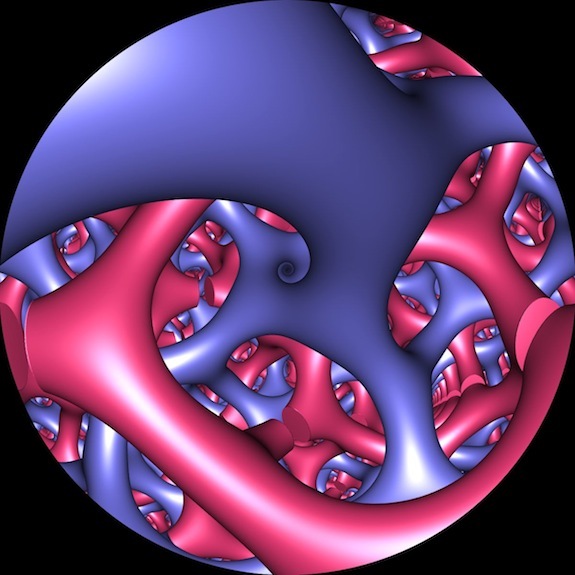 Whether through an simple theorem, an elegant experiment, or the aesthetics of the data itself, the beauty in physics is in the eye of the beholder. Here at the 2012 March Meeting of the American Physical Society, researchers present some of their best research of year to colleagues from around the world. Often unmentioned when we report on novel discoveries, cool physics, or just plain strange science are the illustrations, photographs, and scatter plots that convey the research from the lab to the scientific and public audience. Below and in our image gallery, you'll find some of the image highlights of this year's March Meeting presentations. Physicists are studying photonic crystals that have the ability to manipulate and control light like wires control currents. Now, researchers have found that certain structures, like the scales on the surface of butterfly wings, form labyrinths that can transmit light in new ways. 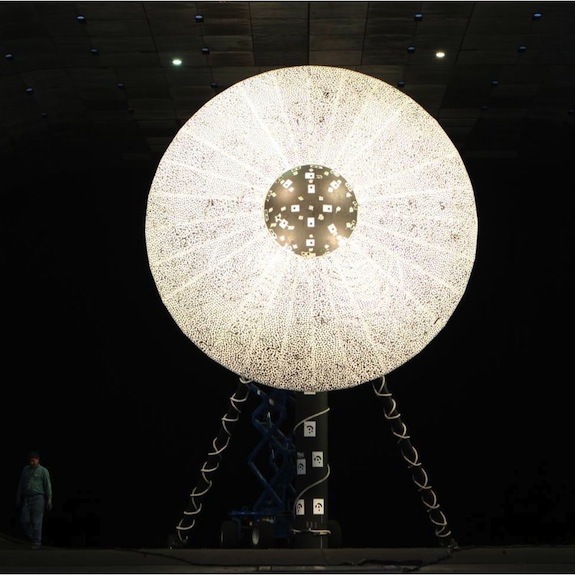 This glowing orb hints at one possible future of space travel. As part of NASA's research at the Ames Research Center, scientists are trying to develop inflatable spacecraft systems that they say could one day change space exploration. Scientists are getting into the thick of things by looking from the inside at what happens when you squeeze a microscopic nanoparticle to extremely high pressures. Using both computer simulations and experiments, the researchers compressed a silicon nanoparticle (blue) in a sea of argonne atoms (green). 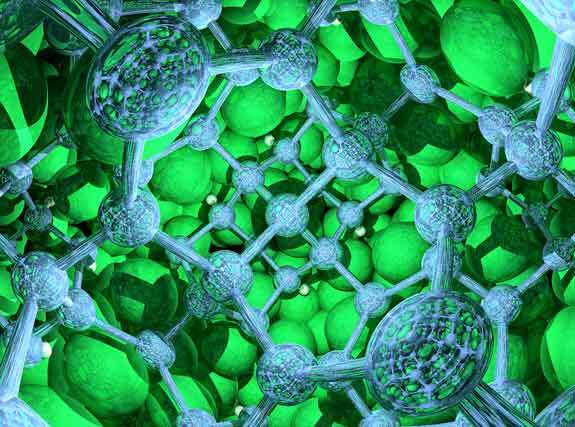 Their research unveiled that high pressure changes the way silicon nanoparticles emit light. Of course, our biased favorite was the sight of a researcher using one of our articles on the Physics Buzz to communicate his own research on the physics of the blues! On the podcast this week, I interviewed author Phil Schewe about his new book, Maverick Genius about the life of Freeman Dyson, a living legend amongst physicists. He's helped solve seemingly impossible problems about the fundamental nature of quantum mechanics, design an atomic bomb powered rocket ship and spark the search for extra terrestrial life. On a brisk Sunday afternoon I hopped off the train and headed to the taxi line, "Physicist?" the bellhop inquired. Well, that's a first, I thought. Then again, it's not every day that nearly ten thousand physicists descend upon the Baltimore harbor for the annual APS March Meeting. The March Meeting is the world's largest annual physics meeting, bringing together many research areas within and related to physics. Indeed, with over 8,000 talks delivered over five days, the scientific program is reminiscent of a small city's phone book. As the strange yet successful field of quantum mechanics has grown over the past century, its many philosophical interpretations have also mushroomed. Physicists remain divided over how to interpret quantum mechanics, with philosophies ranging from the "many-worlds" hypothesis to the "shut up and calculate" mindset. A few months ago, quantum physicist Maximillian Schlosshauer (University of Portland) and his colleagues published a poll among a group of physicists, philosophers, and mathematicians on their views of quantum mechanics and the nature of reality. Now another physicist, Christoph Sommer (University of Munster, Germany) has posed the same questions to a younger crowd: graduate students. While the students' philosophical views often mirror those of their older counterparts, they diverge on several key questions from the 16-question poll on the foundations of quantum mechanics. Quantum satellites may beam down powerful data encryption keys. Scientists are pushing to create a space-based quantum communications network that could enable impossible-to-monitor transmissions. In doing so, they might make it possible for someone named Scotty to really teleport some information into space. So what exactly was in all those old fallout shelters? During the 1950s and 1960s, the Cold War was at its height and the fear of atomic warfare with the Soviet Union was terrifyingly palpable. In response, the United States Office of Civil Defense stocked thousands of fallout shelters in the basements of public schools, city halls, apartment buildings and factories with supplies to protect citizens from the radioactive aftermath of a nuclear attack that never came. But what did those rows and rows of storage boxes that everybody hoped they would never need actually contain? In addition to lots of survival crackers, barrels of drinking water and medical supplies, these big public fallout shelters were stocked equipment to monitor the surrounding radiation. However, starting in the late 1970s and early '80s, the federal government stopped supporting the shelter program. Storage budgets shrank, equipment started becoming obsolete and millions of pieces of equipment went up for sale as government surplus. Here's a tour of the most common radiation equipment that might have been stored in the basement of a nearby public school in the event of an atomic attack. In a preprint article posted late last week, a team of astrobiologists claimed to have found fossilized algae embedded in meteorites that crash landed in Sri Lanka late last year. They're making a huge claim: purportedly, remnants of life from space have rained down on our tiny blue planet. The research may seem unbelievable, but it was even published in a "peer-reviewed" journal. These claims, however, are highly dubious. A closer look at this research — and where it was published — reveals how biased, suspicious research can make its way into the headlines. It flows like a liquid, but blood is also similar to the consistency of ketchup. Blood has long been the focus of research -- but it still offers some surprises. A new study reveals that plasma, the fluid in which blood cells travel, behaves a bit like a solid on small scales. SpaceX Dragon Arrives at ISS in "Flawless Rendezvous"
For those who spent the weekend tracking commentary on the sequester or, for that matter, the Snowquester, you may have missed the story of a huge 60-foot robot arm that grabbed a 1,200 pound suitcase flying by the International Space Station more or less 250 miles above Ukraine. International Space Station Expedition 34 crew captured SpaceX Dragon spacecraft with huge robotic arm. On Sunday morning at 5:31 am EST, the SpaceX Dragon capsule arrived at the International Space Station with its second delivery of scientific equipment. NASA's "flawless rendezvous" was the second resupply of the International Space Station by the commercial Space Exploration Technologies (SpaceX). Today, Forbes' unveiled its annual ranking of the richest people in the world. All of the usual contenders made an appearance, and telecom billionaire Carlos Slim took the top spot yet again. While computer scientists dominate many of the upper ranks, one entrepreneur stood out to me: 19th ranked Amazon.com founder Jeff Bezos. 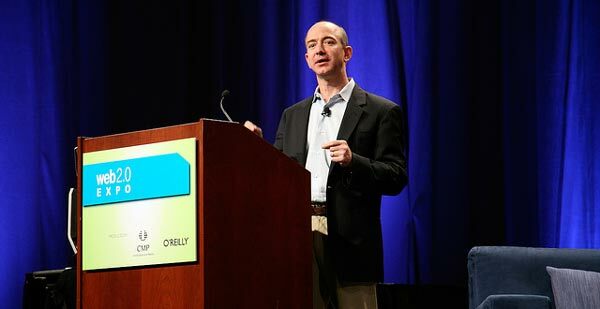 Although Bezos made his money as a computer scientist and businessman, he dreamed of becoming a physicist as a child, eventually enrolling as a physics student at Princeton. His story reveals the powerful impressions a great physics teacher can make and where an initial interest in physics can take you.